Strength training guidelines are really only guiding principles to set you on the pathway of doing things more correctly than not! Although there have been a lot of research into how and why strength training works, and there is general agreement about the broad brush strokes of how things happen. The guidelines are not a set of rules to live or die by. Once you go into any depth on how or why we become stronger, the water tends to become a little murky. Many research papers end with “more research is needed in this area”, so no one really knows anything for certain. Certainly, once you get pass just using body weight to get strong and begin to use equipment to aid you in your strength training endeavours, the dangers of working out with more and more weights will increase your potential to the risk of injury, it is here that safety guidelines are absolutely necessary. Guidelines are also there to help you to improve. They provide you with accurate knowledge of what to do, when to do it and how to do it. To this end I would like to offer some important strength training guidelines which should make life in the weights room just that little bit more productive. A repetition is a single movement of an exercise, for instance, the lowering and lifting of the bar once in a squat is referred to as 1 repetition. To get a training effect, it is normally necessary to perform more than 1 repetition of an exercise. The number of repetitions will usually dictate the type of adaptation the body will undergo. The concept of repetitions cannot be viewed in isolation. When we look at repetitions we must also take into account the amount of weight on the bar. There is an inverse relationship between the weight on the bar and the amount of times it can be lifted. 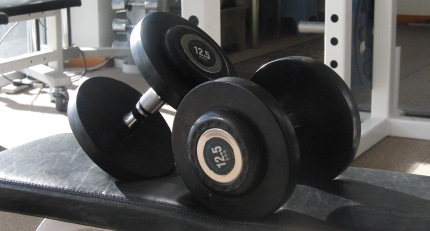 So, with a heavy weight, fewer repetitions can be done than when a lighter load is lifted. A set is a defined series of repetitions. For example, you might schedule 30 repetitions in the bench press for a particular workout. If the weight is heavy it would be impossible for you to achieve the 30 repetitions in one go. However, if you were to divide the 30 repetitions into 10, it might be possible for you to achieve your goal by performing 3 lots (sets) of 10 repetitions. Dividing your workouts into sets is important. A muscle or a group of muscles need to be stimulated many times before it will adapt to the stress being placed on it. Separating your total workout into sets, makes it possible for you to accumulate the large amounts of work needed to achieve your training aim. The training volume is the total amount of work performed in a set, workout, cycle or training year. For example, an athlete does a bench press of 3 sets of 10 repetitions with a load of 100 pounds. That would equate to 3000 pounds being lifted in that set for that exercise. Also remember that the stimulus will be repeated several times per week. It is also common knowledge that increases in training volume over time is important for improved performances and it takes a large amount of work to improve performance. From research data we know that it takes between 8 – 12 weeks of rising volumes of strength training for any significant signs to be seen in muscular improvements (improvements due to neural factors notwithstanding). These are just a few strength training guidelines to get you started. Understanding just these alone will put you on the road to improved performances. Sign Up For The Latest Track And Field News And Improve Your Athletic Performance! From "Strength Training Guidelines" To "Faster, Stronger, Better – Your Shortcut To Improved Athletic Performance"
it only to send you Track and Field News.